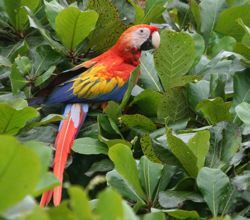 T he Corcovado National Park Full Day Nature Tour departs from Punta Uvita at 7:00 AM and arrives approximately 1 ½ hours later at San Pedrillo Ranger Station in the Corcovado National Park. Upon arrival you will prepare for two guided nature tour hikes along two different trails and observe beautiful flora and fauna. Each hike takes around 2 hours. During the hikes you will be able to see many mammals such as spider, howler, and white-faced monkeys, sloths, coatis, raccoons, and tapirs as well as a great variety of birds, plants, and trees with over one hundred years of existence and in danger of extinction. After the first hike, we serve a picnic lunch near the San Pedrillo ranger station and then we begin the second trek. During boat transit from Punta Uvita beach to Corcovado National Park you may observe whales, dolphins, turtles, marine birds and fantastic views of the southern pacific Osa coastline. The boat returns from Corcovado National park at 2.00 pm and arrives to Punta Uvita at 4:00 p.m. DURATION: Full Day/ Tour operate with minimum of 5 people , please check availability with our reservation department.